William Gadsby was born at Attleborough in Warwickshire on 3 January 1773. When about twenty years of age he was baptised and joined a Baptist Church at Coventry that was pastored by Mr John Butterworth. While Pastor over the church in Manchester, Gadsby travelled over 60,000 miles and preached nearly 12,000 sermons. His manner of life was consistent with his profession of Christ; kindness and friendship were conspicuous. Being benevolent and hospitable he was constantly engaged in acts of mercy and he gave food to the hungry. It is said that he was a ‘good man’ and was made a blessing to thousands. 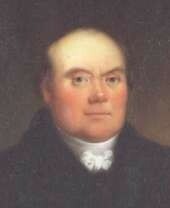 He died on January 27th 1844 aged 71. In doctrinal matters, he was a controversial figure because he maintained that the Gospel not the Law was to be the believer’s rule of conduct. However, he always repudiated any suggestion that a Christian was free to live in sin. He also rejected the view that unbelievers should be called upon to repent and believe the gospel. However, he did use remarkable freedom in presenting the gospel of the grace of God. Gadsby was a prolific hymn writer although not having great poetic talents for on occasions the rhymes and metres used were faulty. One or two are of the highest order, for example, ‘O what matchless condescension’ and ‘Immortal honours rest on Jesus’ head’. He compiled a hymnbook for his own congregation. Due to its success, it was enlarged on several occasions and remains in print today. It is possibly the oldest hymnbook amongst those still regularly used in England. It is primarily used by Gospel Standard Strict Baptists. Most of the hymns are drawn from other writers but over 150 are by Gadsby. It is interesting to note that an edition of Gadsby’s Hymns has in recent years been published in the United States. In 1835 he commenced together with his son John The Gospel Standard Magazine which is still published today. Baptists in the Nineteenth Century, Didcot 2002 Oliver, Robert W.